May explode from heat, shock, friction or contamination. May ignite combustibles (wood, paper, oil, clothing, etc.). May be ignited by heat, sparks or flames. 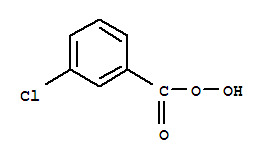 3-Chloroperoxybenzoic acid is sensitive to heat. Storage of 3-Chloroperoxybenzoic acid must be done so with stringent temperature control measures. It's explosion hazard is also mitigated by mixing the peroxide in a solvent slurry.